Kaspersky has always provided Computer Bild magazine readers with a version of Kaspersky Internet Security software suite, in the name of Kaspersky Security Suite CBE, that also comes with free activation license key with 1 year subscription period. Kaspersky has updated the free offering of Kaspersky Security Suite CBE 09, with free download of Kaspersky Security Suite CBE Win7, primarily aim at users of Windows 7. 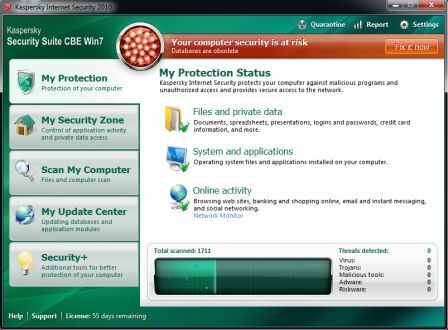 Kaspersky Security Suite CBE Win7 is essential similar to Kaspersky Internet Security 2010, with both has the same build version number of 9.0.0.736, and includes complete protection features such as anti-virus, anti-malware, anti-rootkit-, anti-Trojan, anti-worm, anti-spam, parental control, two-way firewall, Urgent Detection System, Security Analyzer, Safe Run, Auto-Run Disable, iSwift and iChecker Scanning, virtual keyboard, URL Advisor, whitelisting and application control. Kaspersky Security Suite (KSS) CBE Win7 setup installer together with registration instruction is published on the Computer Bild magazine cover disc. Users who want to install KSS CBE Win7 will have to register for Computer Bild account to retrieve the free activation code to activate Kaspersky Security Suite CBE 09/Win7. The original Kaspersky Security Suite Win7 (2010) is in German, however, the default language can be changed with little registry hack. Here’s the procedure to get the free license and activation serial code valid for 1 year subscription for Kaspersky Security Suite CBE Win7, together with download link for setup installer and the hack to switch to English user interface. Note: For user who already has a ComputerBild.de account, the registration steps can be skipped, and can go directly to Kaspersky Security Suite CBE Win7 product page instead. Fill in the registration form, and tick the check box to accepts terms and conditions. The translated meaning of the field in shown in figure below. Click on Registrieren button to continue. Check the mailbox for email from ComputerBild.de and click on the activation link. Login to the ComputerBild.de account, if haven’t logged in yet. Select and tick the second check box which says Personlichen Lizenzschlussel anfordern oder verlangern. Click on Lizenzschlüssel anfordern button. Another email will be sent, together with a common activation license key code to activate Kaspersky Security Suite CBE 09, which also works for Kaspersky Security Suite CBE Win7 (2010). Note: Everybody will receive the same serial key number, which is KAFR4-K8F1Z-GK5XA-RJK2Y. Download Kaspersky CBE Win7 Security Suite setup installer: kis.de.msi. Use the received license key code to activate Kaspersky Security Suite Win7 CBE. The installed Kaspersky Security Suite CBE Win7 will be in German language. To switch and change the user interface to English, open up the Kaspersky window, and click Einstellungen button for Settings. In the left pane, click on Einstellungen. Deselect and untick the Selbstschutz aktiveren option. Click OK to close the Einstellungen window. Shutdown and exit any Kaspersky process (by right click on Kaspersky icon and select Beenden). Change the value of Localization to en from “de”. Run Kaspersky Security Suite CBE Win7. Note that each Kasperksy Security Suite CBE serial key is giving free subscription period of 3 months by default. Return to sign in at the following website every quarter to get updated or new reg key to renew activation for up to a year’s free protection. Tip: User having problem to activate online or require offline activation key file, here’s how to activate Kaspersky 2009/2010 products via key file.